We hope you have been enjoying the vendor previews leading up to the Funky Finds Holiday Shopping Experience! Be sure to make your shopping and wish lists so you don't forget to purchase anything at the event. 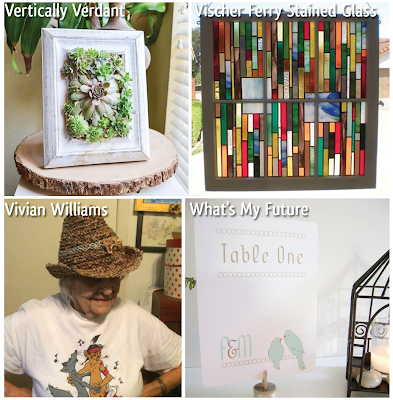 Paper and Place - Erica Taylor expresses her passion of creating with a collection designed to connect adoptive parents, humanitarians, world travelers & military families to special places & their loved ones. Patty's Perfect Pocket LLC - A pocket available for many uses - hold cell phone, iPod, insulin pumps, and more! The perfect accessory for any occasion whether you're at work, at the beach or kicking up your heels! Peculiar Pieces - A talented sister duo who collaborates to provide diversity in style, creativity and originality. Their one-of-a-kind pieces are as unique and individual as you. Playing With Wood Country Style - A family owned and operated affair featuring hand-crafted items using new and/or repurposed wood. 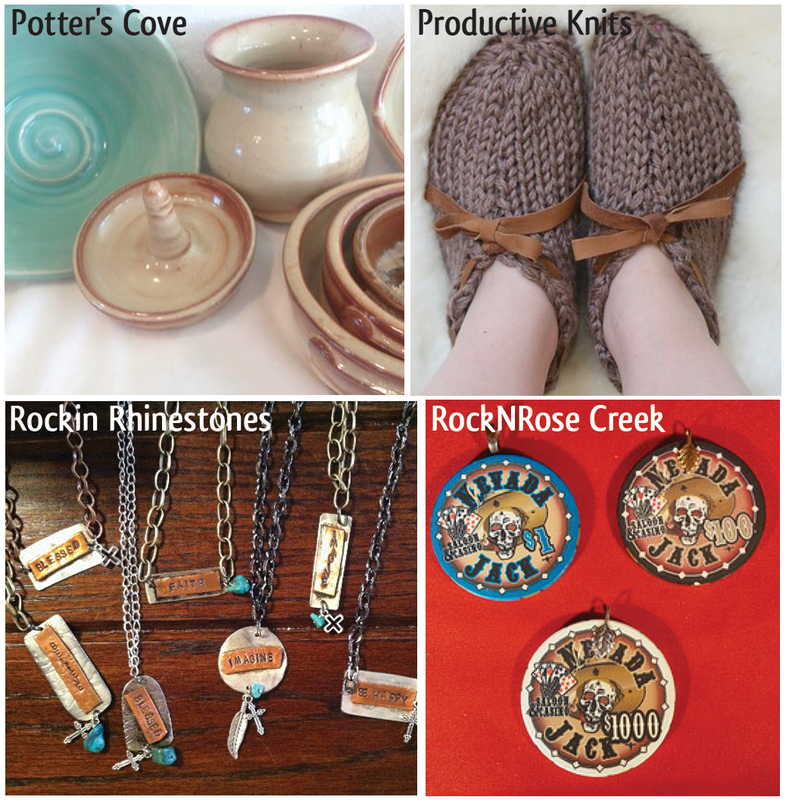 Potter's Cove - Rachael Swink creates pottery that is functional and can be used by everyone. She provides pieces for both people AND their much loved pets. Productive Knits - Kiki Alusick designs her own patterns that she knits and assembles by hand. She likes to keep things simple, warm and natural, as well as functional. Rockin Rhinestones - Kristi Cross designs unique jewelry and accessories that are a great addition to any style. 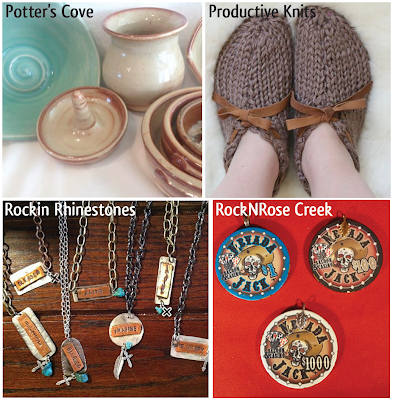 RockNRose Creek - Victoria Gassett has been redesigning lost treasures for many years. 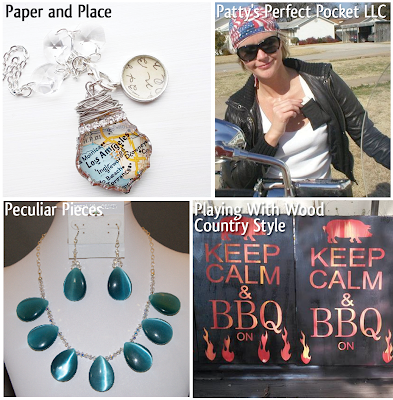 She enjoys creating many different items, including home décor, furniture restoration, birdfeeders, and windchimes. 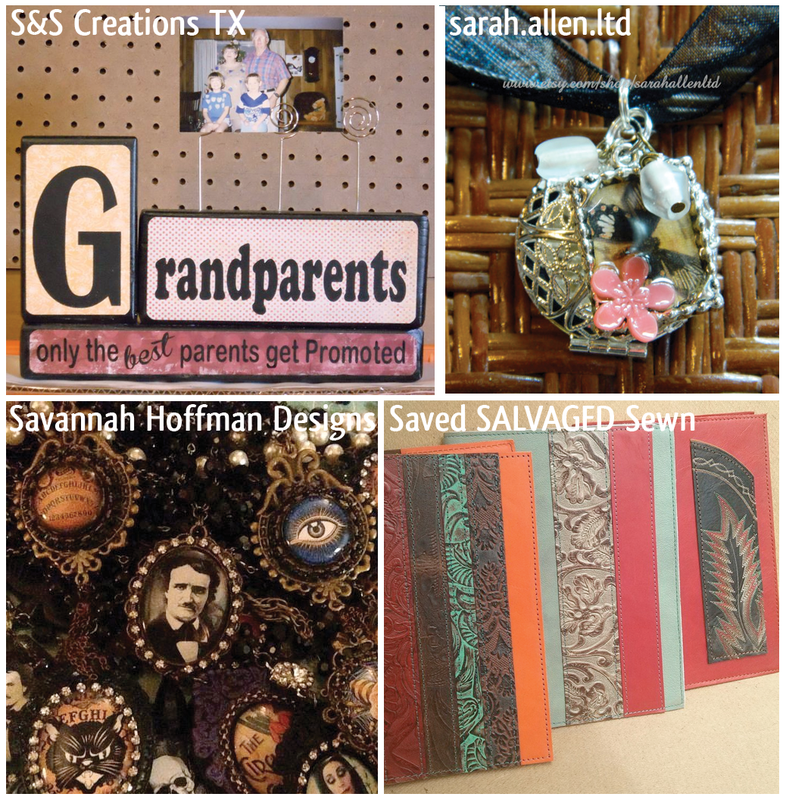 S&S Creations TX - A Mother/Daughter duo that work together to create one of a kind treasures from largely "re-claimed" items. Ninety percent of their product line has come from someone's discards resulting in their motto of "We don't fulfill a need, we fulfill a desire." 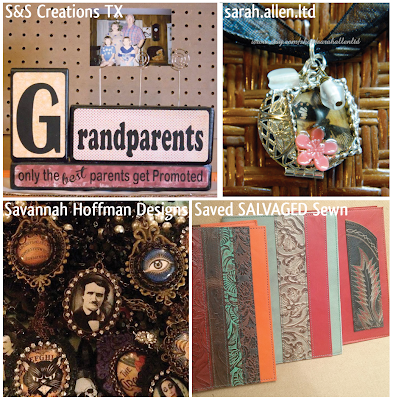 sarah.allen.ltd - This creative duo is comprised of a stay-at-home-mom and a retired school teacher who enjoy going to craft fairs and are having a wonderful time meeting new people. Savannah Hoffman Designs - Felicia Akop creates a line of jewelry in a style she refers to as retro modern. She finds beauty in ordinary things, such as bus tokens and keys, and loves to mix them with pearls or something else unexpected. Saved SALVAGED Sewn - Stacey Stastny creates refillable Leather Journals, Sketchbooks, Notebook Covers and more. Every item is handcrafted using scrap and salvage leather and old cowboy boots. 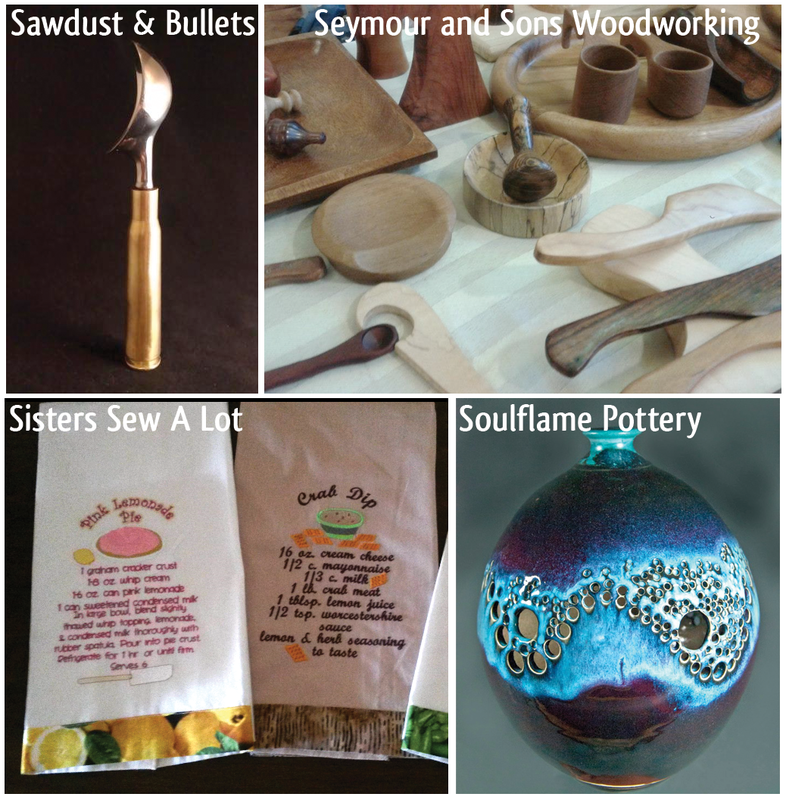 Sawdust & Bullets - Diana & Charla love to create unique pieces of functional art with a one-of-a-kind flair. Items like ice cream scoops can be created with an acrylic, wood or 50 caliber shell handle. 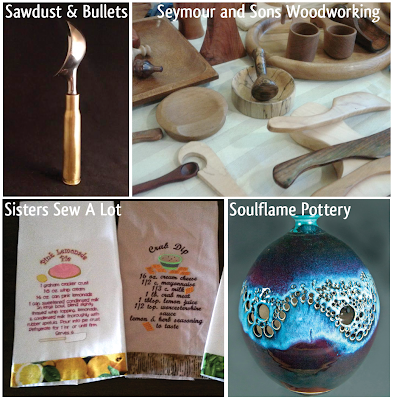 Seymour and Sons Woodworking - Thomas Seymour & his family strive to create items that are pretty, usable and affordable. Each family member has a role in creating each one-of-a-kind item. Sisters Sew A Lot - Sisters Carolyn & Janice have been sewing since they were children. 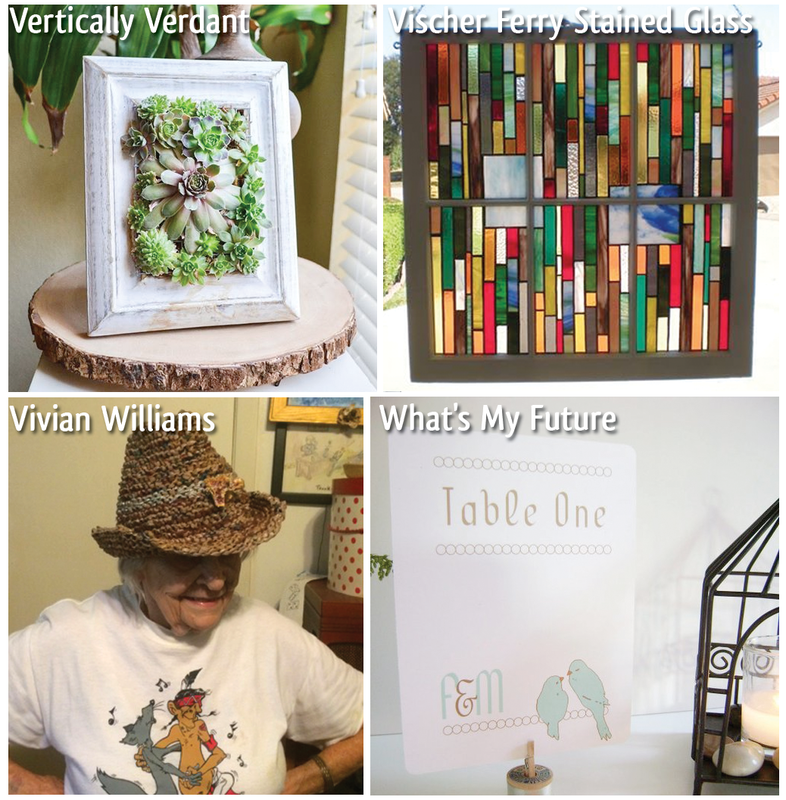 Having created & taught techniques for years, the retired sisters started this adventure to satisfy their creativity and to present quality items for people. Soulflame Pottery - Husband & wife team, Roy & Cindy, teach introductory & advanced ceramics classes for adults & children of all ages. They also create beautiful ceramic pieces! South Austin Gallery - Husband & wife team, Jennifer & Joseph Worth, began their business in 2005 while traveling throughout 19 different European countries. Their goal is to highlight the artistic essence of various cities, while capturing the memories of their customers. Sycamore Sticks - Kim Brown learned to create jewelry as a result of her love for rocks, stones and beautiful glass. She strives to create jewelry that appeals to all age groups while remaining affordable. Sylva Pagana - A husband & wife team living in a country cottage where they hand-craft their all-natural bath & beauty products. They specialize in beard care, solid and spray perfumes and colognes, and alchemy arts. TabbyCat & Co. - Teresa Meredith uses fabric to create desirable handbags, totes, coasters, and much more! 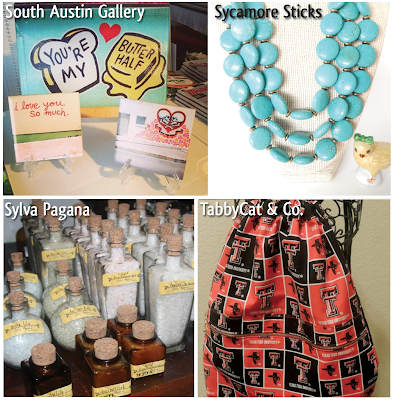 Tasteless Designs - Amanda Sims is a Texas native who has been crafting her entire life. A tight budget made her accustomed to reduce, reuse, and recycle as a budget issue and later for moral and environmental reasons. Currently, she's focusing on spinning and dying yarn, but still makes things for those that cannot knit or crochet yet. Texas Hill Country Olive Company - A family-owned business located in Dripping Springs, TX committed to supplying the highest quality olive oil produced in the United States. Their certified organic olive orchard features a Tuscan-inspired mill house, a state-of-the-art Italian olive press, and a large tasting room. 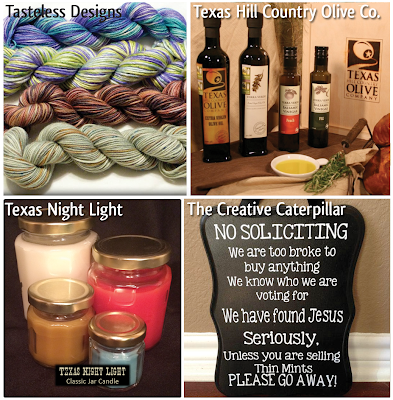 Texas Night Light - A family-owned and operated small business that is all about setting the mood with candles that are "hand-poured, the real Texan way." The Creative Caterpillar - Mandy Duncan is a busy mom trying to make the most of her time with her kids by crafting, creating and selling! She currently sells in Canton at First Monday Trade Days. 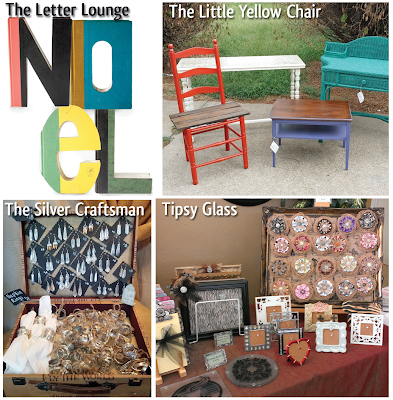 The Letter Lounge - Founded by Mike Clem, Letter Lounge operates as an independent family business in Dallas, TX. Mike carefully considers each reclaimed book's story as he transforms it into a custom piece of typographical art. The Little Yellow Chair - Julia Moore loves color & redesigns all of furniture with this in mind. She strives to provide the public with solid pieces at affordable prices that will brighten up any space. The Silver Craftsman - Sheldon Roy is a teen entrepreneur who enjoys offering many different hand-crafted items made from re-purposed silverware. Tipsy Glass - Unique Handmade Gifts created by Rebecca Ahumada. Vertically Verdant - Lauren Overzet started Vertically Verdant in February of 2014, designing and crafting her own unique vertical gardens. She lives in Fort Worth with her husband and two dogs, and gardens constantly. Vischer Ferry Stained Glass - For more than 30 years, Dan & Bonnie Carlson have enjoyed designing and creating stained glass works of art. Each of their pieces is handcrafted using the traditional copper foil technique. Vivian Williams - Vivian Williams is a retired 86 year old artist who has been making recycled plastic bag hats for five years. What's My Future - Jennifer Hadley-White loves making stationery that is pretty, yet fun & creative. She recently began incorporating fabric, wood, embroidery, and paper clay to create unique sculptures. Wicked Whatnots - A husband & wife team that have a love for graphic arts & repurposing all sorts of things. The duo creates altered art designs & uses the images to create unique & funky fun to wear jewelry & flasks. 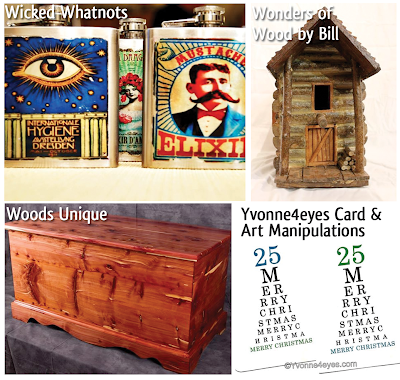 Wonders of Wood by Bill - William Garrett & his wife build rustic custom wood bird houses (Wood Tweets), custom wood accent pieces, and custom wood children's pieces (Wood for Tots). Woods Unique - Jeff Ralston, owner and artistic craftsman, established Woods Unique based on the belief that the customer's needs are of the utmost importance. Jeff doesn't use computer-operated machinery, laser guided shapers, or other "factory" type production methods. Each piece is individually handcrafted so there will be differences between pieces. Yvonne4eyes Card & Art Manipulations - Yvonne Wilson is a self-taught artist who wore her 1st pair of glasses at the tender age of eight. Her charts, sketches, & need to cut are a reflection of what she has seen behind glass as a child and what she sees daily.